Nice post! Musta smelled good around there! I wonder if using tobacco byproducts cause the spread of tobacco mosaic virus to other crops? My father was a chemist and I remember him talking about Virginia-Carolina Chemical. He may even have had an investment in it at one time. VCC was bought in the early 1960's by Socony-Mobil, later Mobil Oil which has since merged with Exxon (nee Standard Oil of N.J.) to form Exxon-Mobil. Exxon-Mobil still has a very important chemical business. My dad Charles Tayloe Harding of Washington, NC worked for VC for 49 years becoming President of the Company in the early 60's. When Mobil acquired VC he became a Vice President in the Chemicals Division. Dad retired in 1967 and moved to Lakeland, Florida where he continued his career in the phosphate industry until his death in 1984. A plant in Nichols Florida was named after him...The Harding Plant. My father purchased the V-C Fertilizer (VCC) plant at Lynchburg, Va. in 1968 - about four years after it closed. The seller, at the time, was listed as Mobil chemical Corp. which is now part of Exxon-Mobil(XOM). XOM is now engaged in a voluntary cleanup of this and other former VCC sites. Of course, they've got the money to afford it and there can be no doubt that there's a cerain amount of self-service involved - like reducing potential future liability. But on the other hand, nobody is pressuring them to do this and I, for one, appluade for their good corporate citizenship. You might find it interesting to know that Samuel Tate Morgan at one time owned the Bennett Place and planned to develop it as a Civil War tourist site, an early theme park. Thanks for mentioning that Curtis - it is mentioned at the Bennett Place post. I have a log book from Virginia-carolina chemical company with a list of brands, other companies, measurment and weight instructions, and some hand written names. The calender on the back is dated 1906-1907. I wonder if it is worth anything? Anyone interested in them? I was going to throw them away! I was metal detecting at the site of a long gone plantation outside of Pikeville, NC yesterday and found an old watch fob that says, "Compliments, Virginia-Carolina Chemical Co, North Carolina Sales Division, L. A. Carr, M(? ), Durham, NC" Very interesting find, this is a great website. If you still have it, I would be interested in buying the log book. I don't know if it has any commercial value but has sentimental value for me, since Samuel Tate Morgan, founder of V-C Chemical, was my great-great-grandfather. Please don't throw them away! If you still have them, I'd like to own them just for their labels. My great-great-grandfather founded the company. My grandfather and dad both worked their entire lives at Virginia Carolina. I don't know what my grandfather's job was, but my dad was a maintenance man. He started as a lead burner. I was born in Durham, N.C. We also lived in Charleston, Birmingham (plant in Wylam), Fort Wayne, Ind., Shreveport, La. and finally Savannah, Georgia. By then, I think it had sold to Swift and then to Mobil Oil. The plant in Wylam burned to the ground when I was a little girl and that is when we were transferred to Indiana. Dad sure did not want to go up North. My dad (Elza Robert Wallace, Jr.) and my Grandfather (Elza Robert Wallace, Sr.) both worked their entire lives at Virginia Carolina. Dad was nicknamed Bob or Hardhead. I have a book of accounts for purchases and payments to Virginia Carolina Chemical Co. beginning in 1918 and continuing through 1923 in the Rowan County, NC area which was kept by my grandfather as agent. There is also a Chattel Mortgage to Virginia-Carolina Chemical Co., of Richmond, VA dated 1921. My Grandfather Edgar D. Holcomb Sr. Worked for VC from the early 1920's till when it was sold in the 60's. He worked in Georgia later moving to Jacksonville for several years and settled in Orlando where he raised his family. Edgar worked in the business /accounting office. As a child I remember in the early 60's my Grandfather talking about His career with VC and how proud he was to work for them all the way to retirement. I grew up in Stuart, Florida and we have a feed store in the downtown area that prominently displays a large "VC" oval sign over the entrance way. The Stuart Feed Store is a Heritage Museum/Historical Site and the sign is still there. Every time I go past the feed store the sign fondly reminds me of my Grandfather. I have a ladies handheld mirror. The back of the mirror has a picture of a lady and the following: compliments of virginia-carolina chemical co. North carolina sales division, L.A. Carr, Mgr., durham, N. C.
I think I have pencils and a couple of small note books with VC on them. I went to my 50th HS reunion in Mt. Pleasant, Tn and was given a black and white picture of the old plant. There was a picture of the house we lived in. The area was called "Frog Bottom". Thank you for this wonderful site. My daddy, Royce Lee Stallings, started working at the Durham V-C plant in the late 1940s. He was a book-keeper in Durham, but then went on to the plant in Selma, NC (1954-1962) where he was book-keeper and then assistant manager, then back to Durham for one year before becoming the plant manager in Charlotte, NC (1963-64). He then was transferred as manager for the Baltimore, MD, plant. From there, he spent several years in Connecticut, then finished out his years at "V-C" (which was Swift [or Estech?] by this time) in Athens, GA. I still a few small V-C advertising items. I can remember my mom and Marie Curry (whose husband Dave also worked for V-C for many years in Durham and then Florida) laughing and dancing around singing the jingle, "It's V-C for me! It's V-C for me! My crops agree--they grow for me see? It's V-C for me. It's V-C for me." Daddy was fiercely loyal to V-C (and the later versions of the company). He died of cancer in 2002, and at his funeral an old V-C man told me that Daddy was one of the few people who knew the formulas by heart and could mix the fertilizers to perfection. I have many fond childhood memories of the Selma plant. And I can't walk past a stack of fertilizer in a garden shop without the fragrance taking me back to the smell of Daddy's work boots (which he took off as soon as he got home) and the smell of the plant when we'd go to pick him up from work. Does anyone have records of G. Donald Allen who managed the mixing plant in Shreveport from (1940?) until 1958(?) when it closed. He moved to corporate and I lost track. I am really trying to find his children with whom I went to school 1953 to 1956. 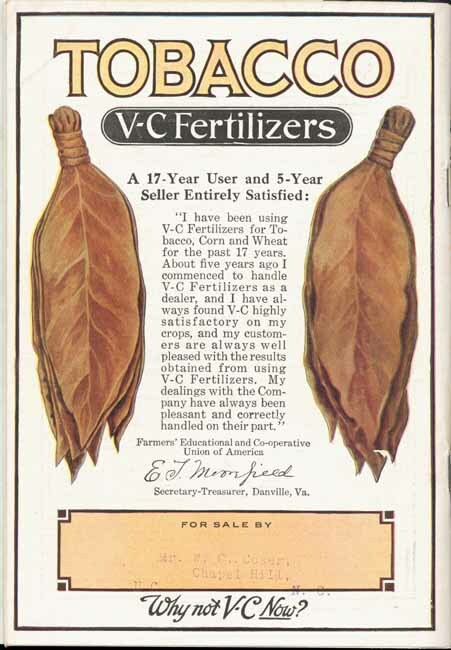 Samuel Tate Morgan, in partnership with Eugene Morehead, and Louis (Lewis) Carr, established the Durham Fertilizer Company around 1881; he hit upon using a waste product of the tobacco production process - the stems - to make fertilizer. On September 12, 1895, he formed the Virgina-Carolina Chemical (Fertilizer) Company, which was headquartered in Richmond, VA. 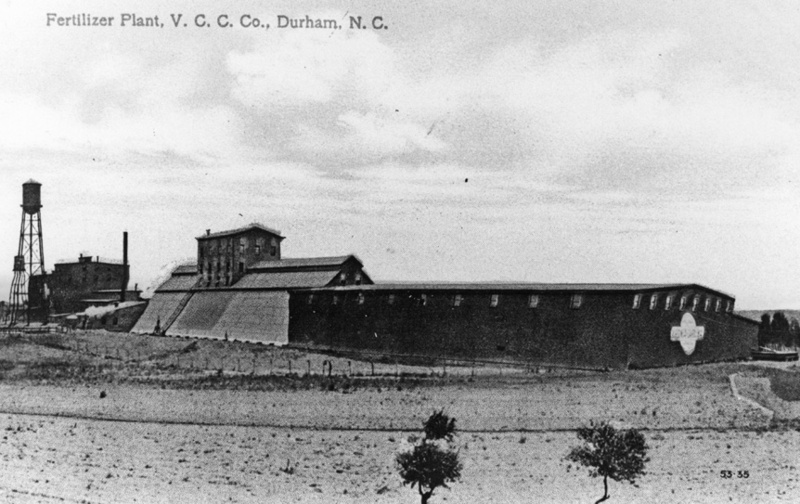 The Durham plant was located on Angier Avenue (the Macadam Road) - east of East Durham. 1913 Sanborn Map Sanborn Map. 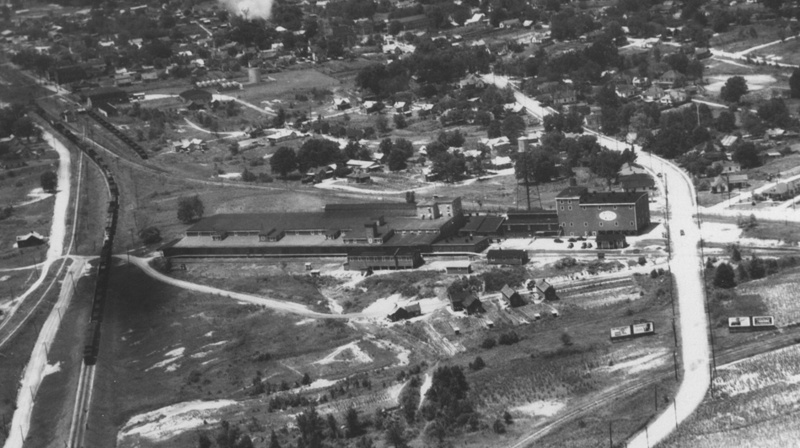 Aerial looking west towards downtown, ~1940. The main railroad line is to the left of the plant and Angier Ave. to the right. "The first step in the work here is the manufacturing of sulphuric acid which in turn is used to make super-phosphate, a major ingredient in commercial fertilizers. For the acid work there are huge containers, partly surrounded by vats that give the plant an air of a melodramatic movie." "After the sulphuric acid comes the actual making of super-phosphate. The acid is mixed with phosphate rock shipped here from the company's mining operations. There was a pile of super-phosphate weighing about 3,000 tons at the plant recently." 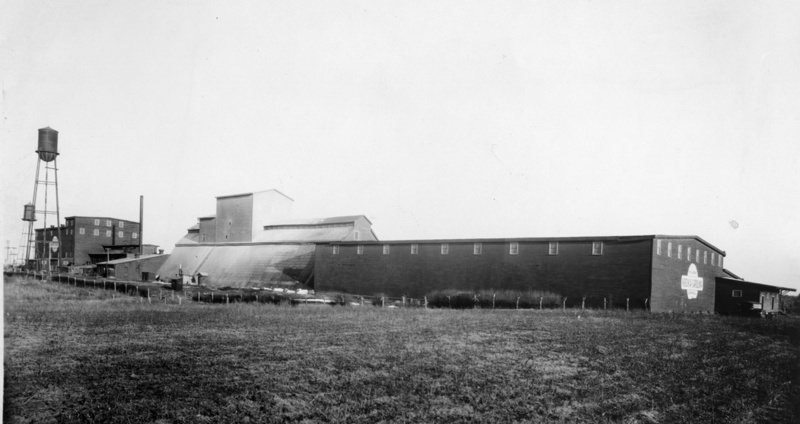 "Then, with materials brought from all over the United States, the plant here mixes various grades of fertilizers, an exacting work that [plant manager WM Caldwell] described as 'mixing prescriptions on a terrific scale.'" "Fertilizers made at the plant run from fish pond fertilizer to tobacco fertilizer, general crop and pasture fertilizer. It is shipped to a surrounding area of about 100 miles." The company was listed in the Fortune 500 from 1957 to 1963. The papers for the company seem to terminate at 1965, though I don't know the cause of death. The plant itself seems to have still been around in 1972. Sometime later, likely in the 1970s or 1980s, the plant appears to have been demolished and replaced with another industrial center. It appears, from the multiple listings at that address, that the present-day building provides space for numerous tenants. Site of the Virginia-Carolina Chemical Company, 01.01.09. Please don't throw them away!